DRX Duct is committed to providing superior residential services for duct cleaning in North Plainfield and Bridgewater, NJ. Our trained technicians take great care in keeping our customer’s homes protected while conducting a job that is clean and as professional as possible. We use the most advanced equipment available. Call today at 908.755.2950 for a free estimate on residential services for a duct cleaning in North Plainfield and Bridgewater, NJ. 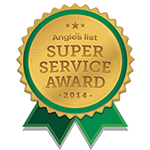 We recently have been awarded 2012, 2013, 2014 Super Service Award by Angie’s List. 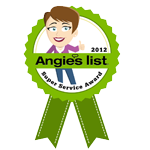 Additionally, we were issued a rating of “A+” from the Better Business Bureau. DRX Duct strives to go the extra mile, so you will be pleased with our residential services and the quality of our work for customers who need duct cleaning. We place a huge emphasis on professionalism, ensuring our workforce is highly trained. You can feel rest assured that every work site is clean, secure, and free of drugs and alcohol. We are capable of handling any job by using state-of-the-art machinery, tools, equipment, and procedures that our employees are trained and equipped with. We also offer vent cleaning services, so we are able to thoroughly clean your entire HVAC system. Feel free to contact us at 908.755.2950 for any of our referrals with your questions about duct cleaning in North Plainfield and Bridgewater, NJ. The HVAC system’s supply and return side are “zoned” so as to clean them separately. This is usually accomplished using zone bags. In the return side of the HVAC system, a hole is cut so the vacuum has access to the system. The vacuum will be attached using a connection collar, turning the vacuum on once it’s connected. Each return vent cover is carefully removed and vacuumed cleaned. Using both compressed air and physical agitation tools, each branch will be cleaned individually, starting at the farthest and then working to the closest branch. Any rolling dust conditions will be removed with this process. Upon completion of cleaning all of the branch runs, the main trunk will then be cleaned using the vacuum. Once the return side has been cleaned, the supply side will then be cleaned. All supply registers will be cleaned using compressed air and initiation on the main trunk lines. Any etched or rolling dust conditions will be removed with this process. After the entire ductwork has been cleaned, the ductwork can then be sanitized and the furnace can be air washed if applicable. When the cleaning process has been entirely completed, the access holes will be closed and insulated sealing off any leaks, making it easier for the duct systems to be accessed for recurring cleanings. When the cleaning process has been entirely completed, the access holes will be closed and insulated sealing off any leaks, making it easier for the duct systems to be accessed for recurring cleanings. If you need a duct cleaning in North Plainfield and Bridgewater, NJ, call our professionals today at 908.755.2950. Updated on September 24, 2018 at 9:15 pm by DRX Duct Cleaning.